Metro Boomin is the star of Drop Top Wop, a 10-track collaborative project with the ever-mercurial Gucci Mane. Ostensibly recorded over a two-day session, the record finds Gucci continuing to shake off the rust since his release from prison last year. 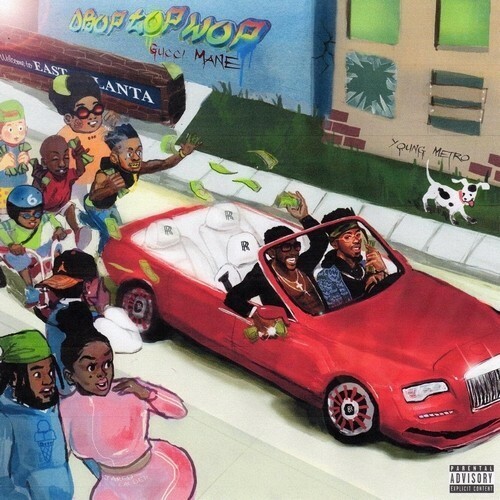 Gucci Mane’s latest may be business as usual, but Drop Top Wop gives the customer exactly what they’re looking for, which is a tried-and-true art within itself, making it another quality offering in the Atlanta legend’s extensive catalog. All told, it’s another win in both artists’ books, but a mild one. The result is a focused effort that highlights Gucci’s versatility and the duo’s remarkable chemistry. Droptopwop, his full-length collaboration with Metro Boomin, is Gucci’s first post-prison project that truly gels. Overall, while a worthwhile inclusion in Gucci's catalog, Drop Top Wop is most likely to be appreciated primarily by the Wop faithful still hungry after a dizzying seven releases within one year. Droptopwop is a return to form insofar as it is the high point of his post-jail music, but a plateau is a plateau nonetheless. Purchasing Droptopwop from Amazon helps support Album of the Year. Or consider a donation?